So I invented a new pie this Thanksgiving. It uses the Salty Pluff Mud Pie filling from the New York Times wonderful dining section containing a recipe from all fifty states for Thanksgiving. 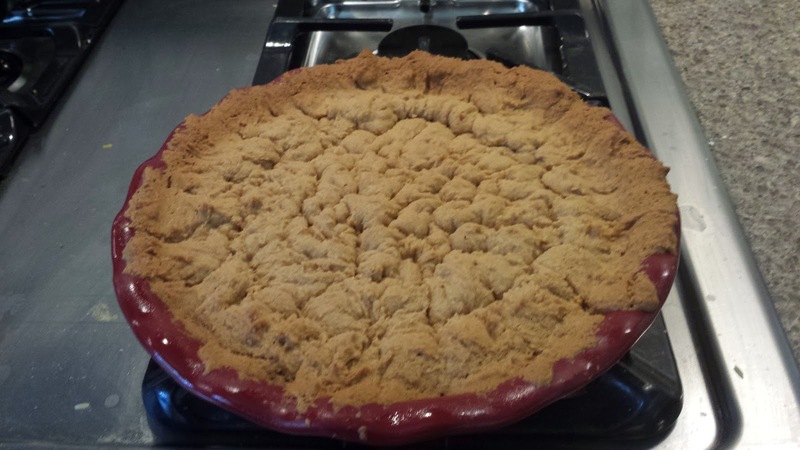 But instead of a regular pie crust, which I always find at odds with Mud Pie, I made the crust out of NYTCCC dough without the chocolate chips. I buttered the pie plate, then covered the bottom and sides with about 1/3 inch of dough. I popped it in the fridge overnight. Then I baked it in a 350 degree oven for 20 minutes. At this point, it looked like there would be no room for filling, but I popped it back into the freezer to chill until the filling was ready and it settled down a bit. Then I followed the Salty Pluff Mud Pie recipe. It came out of the pie plate easily and held its shape well. It was AMAZING! The bottom perimeter of the pie, where the proportion of crust sometimes fails and ruins the whole thing, turned into this caramelized, chocolately, yum. It was alchemy. Before serving, I dusted the top with extra fine sea salt, which truly does bring out the flavor of the chocolate, and topped it with a dollop of vanilla ice cream.